The post about English language mistakes in Thailand proved extremely popular and I have received numerous pictures and emails with examples of "Tinglish" and I shall endeavour to post these at a later date. 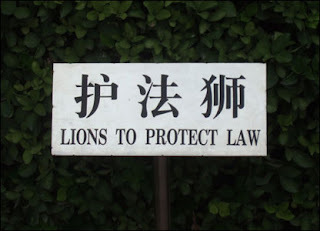 But......today's post is courtesy of a chum who has spent time in Beijing and has come across plenty of rib-tickling examples of "Chinglish". This has been a source of great embarassment for Chinese authorities since increasing numbers of English-speaking tourists have been visiting the country since the 2008 Olympics. But for those of you that have visited the Kingdom this may seem like a contradiction in terms, because the chances are, you have been in situations where there seems to be a lack of "logic" applied. My current girlfriend is Thai as was my ex-girlfriend and I have nothing but good things to say about the majority of Thai people that I have encountered across all walks of life. I believe that the Thai's are the warmest and friendliest people you are ever likely to meet anywhere in the world....however, many lack, what we in the West would call, "common sense". Or as the late grandma Penfold might have said "some of them are as green as cabbage looking". Anyway.... let's move on to the theme of today's blog, which is the use of the English language in Thailand. 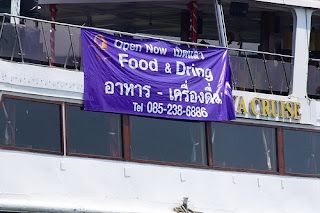 My favourite Bangkok Blogger, the inimitable but now defunct "Mango Sauce" coined the phrase "Tinglish" to describe this melange of English and Thai.....to read some of Mango Sauce's classic examples here's their link....http://www.mangosauce.com/. Yes yes, I know I've been away for a while.....but worry thee not..... I haven't been abducted by kiddy fiddlers or detained at her Majesty's pleasure!!! Although it might be quite amusing being detained, together with her Maj and seeing the look on Prince Phillip's face when he finds out that all we have for entertainment is a copy of the Koran and an audio tape of the selected works of Osama Bin Laden.......!!! The reason for my absence from the "bloggersphere" is slightly more boring and mundane.......I have been trying to work my up the "greasy corporate pole" which requires "application, diligence and hard work" as my employer would say. Or, in the inimitable words of Jim Carey, I'm required to "bend over and take it up the tail-pipe" and be grateful for the mediocre pay cheque that I receive at the end of the month.